You are looking at a ONE-OWNER "Candy White" 2012 Volkswagen Passat SE w/ Sunroof & Navigation. This Passat has been extremely well-maintained, inside and out. I was totally impressed with the test drive! This car drives great! Nice and tight, tons of power. Just an overall, nice smooth drive that you will surely love! Made specifically for the American Market, the Passat is Volkswagen's answer to a quiet, smooth, roomy sedan. Under the hood, it is still a German-engineered Volkswagen, with all of the power and precision that comes with it. The paint is in great condition and the engine and interior were really well maintained. This 2012 Passat 2.5L SE comes with: leatherette upholstery; 8-way power driver's seat; heated front seats; premium stereo with color touchscreen, eight speakers, 6-CD changer, MP3 capability, SD-card slot and satellite radio capabilities; Climatronic automatic dual-zone climate control; multi-function leather-wrapped steering wheel; aluminum dash trim and middle console; exterior chrome window trim; sliding front center console; and 215/55R17 all-seasons on alloy wheels. 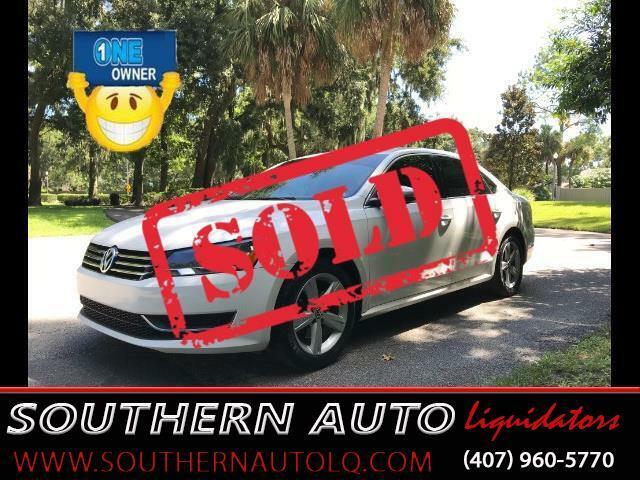 And this Passat was originally bought with additional options added: 6-speed automatic transmission, a sunroof, and a GPS navigation system with 5-inch touchscreen and USB and auxiliary inputs. If you want all the comforts and convenience of a luxury sedan with the power and might of a Volkswagen under the hood - this is the car for you! Give us a call to schedule a test drive, today!